infoSuper capacitor discharge time calculator. This calculator determines timekeeping operation using a supercapacitor (ultracap) based upon starting and ending capacitor voltages, discharge current, and capacitor size. Bt(seconds) = [C(Vcapmax – Vcapmin)/Imax] This formula is valid for constant current only. Bt(seconds) = -log(Vcapmin/Vcapmax)(RC) = t This formula is valid for linear current only (simple resistive load). Vcapmax is the VCC maximum value that the capacitor is charged to. Vcapmin is the minimum operating voltage you can tolerate before your circuit or component, which is backed up by the capacitor, stops working. Imax is the maximum current that your circuit will discharge the capacitor. equation to calculate the backup time. yield a lower working voltage in the range 2,5 – 20V. is 30 Wh/kg, lower than rapid-charging lithium-titanate batteries. EDLCs have a variety of commercial applications, notably in “energy smoothing” and momentary-load devices. home solar energy systems where extremely fast charging is a valuable feature. 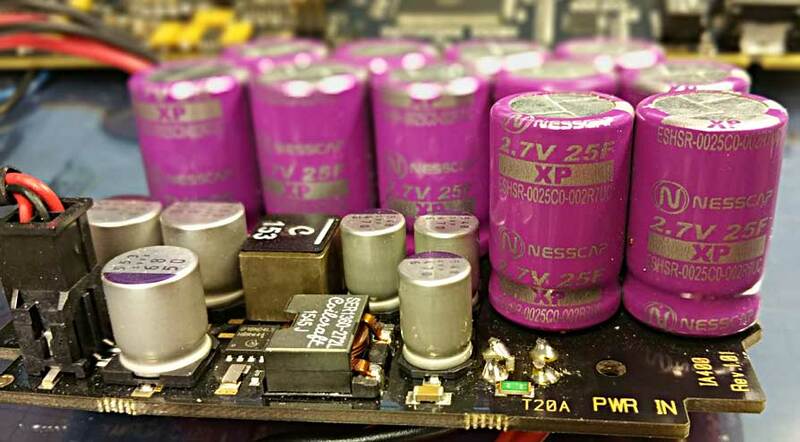 Super capacitors are widely used as a backup power source for realtime clock circuits and memory in microcontroller applications for years. More information in Wikipedia here.